Suzuki Stinger? Not quite but just as exciting, take a look. After the completion of the Kawasaki KH400 then the Suzuki RE5 another restoration was on the cards using all the knowledge, short cuts, tricks, cheats etc that I learned restoring the first two. What bike had I in mind? Got to be early seventies, must be rare but remembered by most and also as I'm running out of garage space has to be petite. So no Honda CBX1000 or Kawasaki 1300, small and quirky, that's the way to go and I had just the bike in mind. A 125 with looks to die for, and a great name. 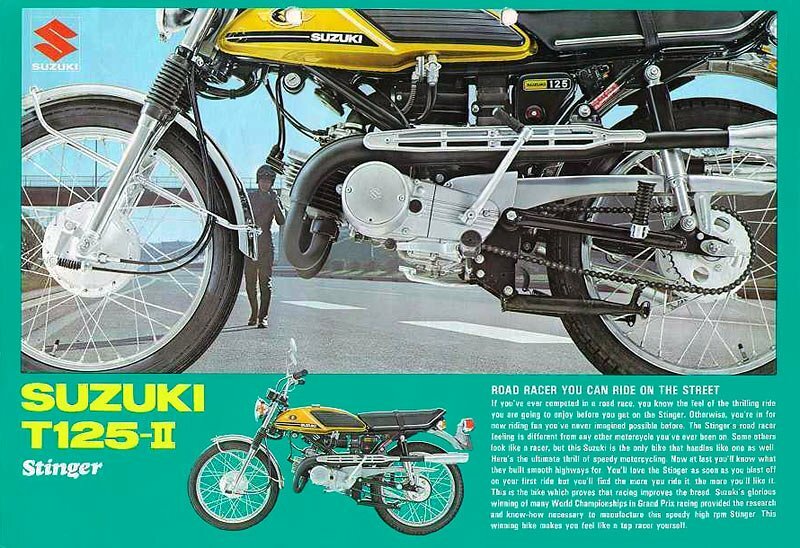 Remember the Suzuki T125 or Stinger as most teenagers knew it, a small screeming or should that be buzzing twin cylinder two stroke with racing looks, a bike that still carries the title as the most exciting 125 from that era. Now you remember it, the Suzuki Stinger T125. 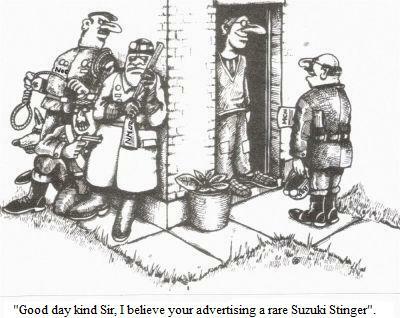 The Suzuki sales paper above shows how it should look, now my quest is to restore a Stinger to original condition with no expense spared. After advertising for a Suzuki Stinger to buy and restore on the Internet on various Suzuki sites I had only one reply but the bike was not really what I was looking for because the restoration was already underway but as no other Stinger was available I decided to go ahead and purchase it anyway. From the photos emailed to me the Stinger looked really good, I was told it ran well and most importantly was virtually original. An agreed price was met and soon I took delivery of the Stinger, yes it looked good and it ran but not a smoothly as I had hoped, so it seemed it needed some work after all. Oh! if only I had done more research into the Stinger, well I had tried but information regarding this bike is really scarce and it took a few weeks before I realized that 'I'd been stung by the Stinger'. So I had more work to do than I anticipated with this particular bike, I was pleased in one respect but felt I was mis led by the seller. The person that sold it to me was quite happy just to stand back and look at what he considered to be a good example of this rare and highly collectable machine, to be honest it was dangerous, the front brake cable was short and would not allow full turning of the handlebars, unbelievably the front and rear brake drums internals were painted silver making the shoes braking performance questionable. The drive chain was knackered and the front and rear sprockets teeth were badly hooked, the handlebars were the wrong diameter tube and had shims fitted to compensate and the indicators didn't work. The Posi Force lubrication system didn't work so two stroke oil had been added to the petrol. There were many other hidden issues, I didn't know wether to laugh or scream? It may have satisfied his standards but it fell way way short of mine, original? Not close. 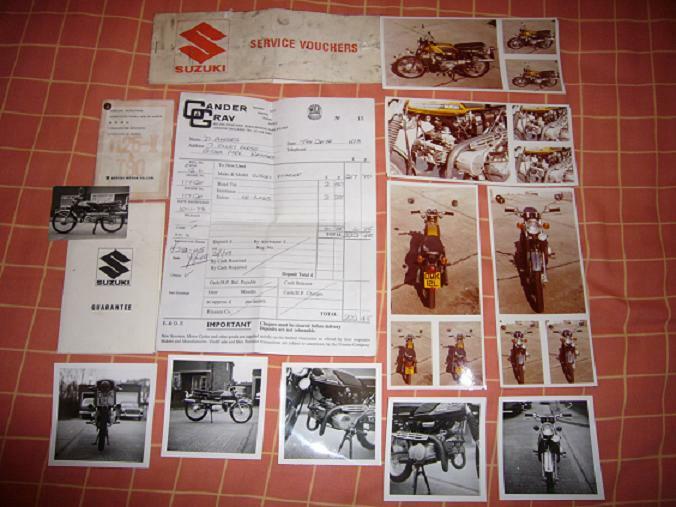 Yes it had some good points, the NOS exhausts were a huge plus and amazingly it came with the original bill of sale and other documents and photos of the bike when new as in the photo below. The frame had been powder coated and was good, the tank had been resprayed and was a pretty decent job but made better when I repainted the original badges, the seat had been recoverd and was a good job but was let down by the finishing underneath so I put that right, the engine cases were different shades of silver, a number of items had been rechromed but others were in need of it, the air filter box was nicely chromed but inside it was full of flaking rust, then there were some parts fitted that looked good but were Chinese after market parts and most annoyingly there were parts fitted from other similar Suzuki models. Some items such as cushions were just not fitted or replaced with bolts and the Chinese rear wheel rim just about summed up what I had bought, a Stinger with potential for an original restoration but with a good number of flaws. I decided to strip the bike completely down to the frame and start the restoration over again to my known high standard. 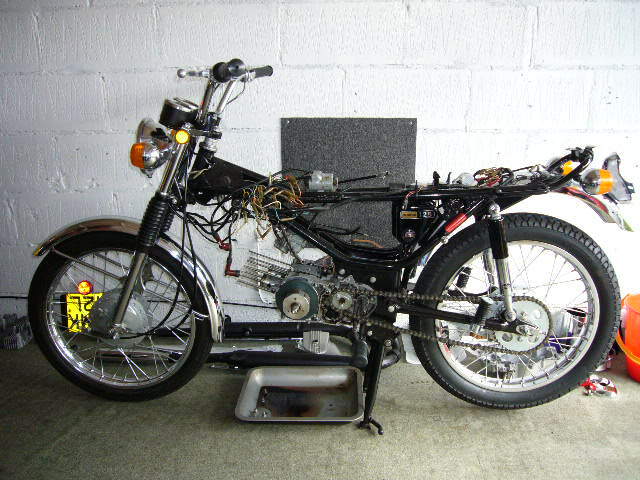 The bike was stripped compleatly, all the parts were placed in boxes ready for replacement, rechroming, repainting or repairing. As with my other restorations it would be one big assembly project once all the parts were ready. Again eBay proved to be invaluable, to be honest the restoration would not have been possible without it, most NOS parts that were listed on eBay had to be bought regardless of cost, the vast majority of parts came from the U.S.A. 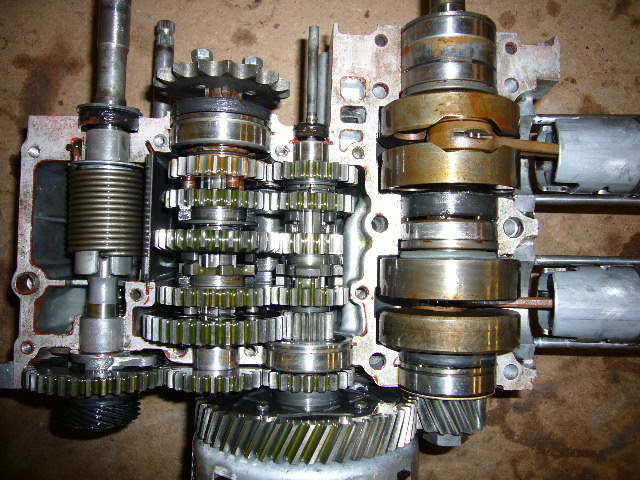 The engine removed and stripped for inspection, no problems, nothing broken and everything within tollerance on standard bore which makes me think that the 3.5K miles on the speedometer may well be correct. The engine cases were resprayed silver with PJ1 high temp. a neat job, I'm quite pleased with the result. The engine was reassembled with new gaskets along with three NOS oil pipes, cylinder head studs and nuts, a pair of expensive heads from the States and other bits and pieces. Fresh oils finished it off. Any suspect parts were changed, starting at the front of the bike that included wheel bearings, cables, handlebars, grips, levers, switch gear, ignition coils, carb pack, air filter, rubber inlet to carb, horn, points, plugs, sprockets, chain, clutch adjuster, chain adjusters, rear light assy, rebuilt rear wheel with the correct rim, rear wheel bearings, mirrors (S type), indicator lenses, exhausts repacked, sprocket carrier, bushes, spacers and cushions and many more Items. Every electrical connection was resoldered using new fittings. Anything requiring rechroming was done along with a good number of items repainted. Now the Suzuki Stinger T125 is complete, it's 99.9% original and to my very high standard. Soooo much fun to ride! When did you last see one of these? With a new MOT, taxed and insured the Stinger is ready, a few blasts up the road and a bit of final tuning and it's soon buzzing along, soooooo much fun. Ready for the first show and it's one that's a little bit special to me. Nab's Head Classic Bike Show 2009, run by the VJMC Central Lancs Section and one that sets standards for other shows around the country. First showing and a win in the 'Lightweight Class'. I'm told later during the day from a very reliable source that the Stinger was a serious contender for 'Best in Show'. I'm really pleased and thanks go to all concerned. The second showing is closer to home, 'Swansea Classic Bike Show 2009', a win here for it's class means two out of two. The third show is virtually on my door step at the 'Gnoll Classic Car Show 2009' there is a section for bikes but this is a tough one as a Japanese bike has never won here, always British. But this year the mould is broken and the Stinger wins 'Best Bike' against heavy competition on a good summers day. Smiles all round, three out of three, do I carry on or quit while I'm ahead? 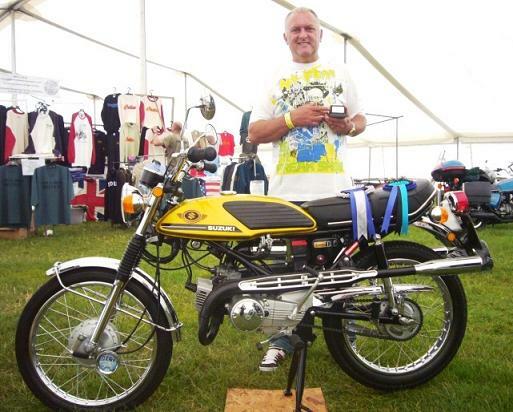 Llanishen Show 2010, 'Best two stroke'..... Four consecutive wins. The big one. 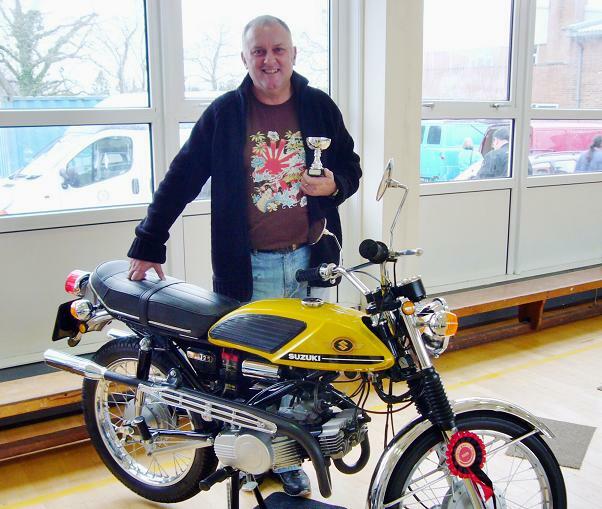 The VJMC Show at Uttoxeter 2010 and the Stinger takes 2nd place for 'Best 70s Bike' and also 2nd place in 'The Lightweight Class 50 to 200cc'. A great double result, 5 shows and 5 trophies . If you thought Uttoxeter was big on the calender events page then Stafford is even bigger, to get a result here is every restorers dream. My dream came true as I won 2nd place in the 'Best Seventies Bike' catagory. It's really comforting when the biggest shows in the country recognise the Suzuki Stinger for what it is, a rare motorcycle in magnificent original condition rather than just a little 125cc bike. Oh yeah! and that's six out of six now. This fighter jet stopped the Ruskies from dropping in on us in the early seventies but it couldn't stop the Japanese invasion. After a third place win at Bristol Classic Bike Show 2012 I decided to sell the Stinger. Sold May 2012.